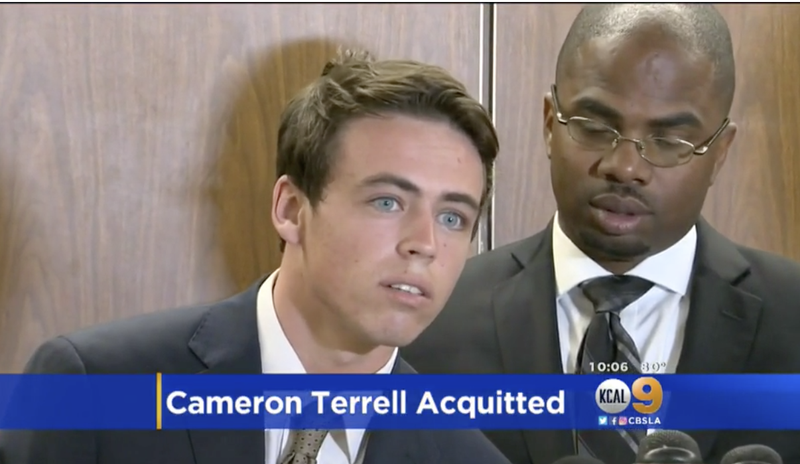 Cameron Terrell was acquitted on Monday after jury deliberations that lasted 10 days. Terrell was accused of driving the getaway car for two South Los Angeles juveniles who are accused of killing Justin Alongino Holmes last October. “Cameron Terrell did not possess any weapons, he did not shoot anybody, he was not part of any conspiracy, or any plan or plot. … At best the evidence suggests that Cameron was a witness,” Blackwell said, according to CBS Los Angeles. L.A. County Deputy District Attorney Adan Montalban attempted to argue that Terrell was a gang member who knew the intent of the two juveniles—who are black—when they allegedly shot and killed 21-year-old Holmes in rival territory. Holmes was with two other friends when they were approached by the two armed juveniles. Holmes told the attackers that he was not a gang member, but he did not survive. The two other men escaped without being harmed. Prosecutors claim that Terrell knew about the planned shooting, especially given that he parked out of sight to let the juveniles out of the vehicle (which belonged to his father.) Prosecutors also showed jurors video taken by Terrell showing his friends kicking down candles left at a makeshift memorial in Holmes’ honor. Blackwell however, insisted that Terrell only thought that a fight would take place, saying that his client was surprised to hear the gunshots, using Terrell driving “his daddy’s car” as an excuse to prove that Terrell knew nothing of the shooting. As for Terrell being in a gang—emphasized by him appearing in several music videos by local rappers and being given the nickname “White Boy,” Blackwell insisted that Terrell should not be judged for being “opened minded” about having friends from different backgrounds who might “walk a different path,” according to the report. Regardless of Terrell’s affiliations, some in the community can’t help but point out the difference in socioeconomics and race when it comes to how the case is handled. “Two black juveniles are probably facing life sentence to where an adult took them to do something where he should’ve been held responsible just as much,” community activist Melvin Farmer said. Indeed the case is all too reminiscent of Ethan Couch, the affluenza teen who killed four people in a drunk driving crash when he was 16, only to receive a slap on the wrist. Couch was eventually sentenced to two years in prison after video surfaced of him appearing to violate his probation, which mandated that he stay away from drugs and alcohol. When authorities started a-knocking, Couch, and his still-enabling mother, Tonya Couch, fled to Mexico, before they were apprehended and deported back to the U.S. In Terrell’s case, however, he apparently now plans to go to college in Houston to study law, because he has a “newfound love,” for the profession, probably due to the fact that he is skipping away unscathed. “Rest in peace, Justin Holmes, you shouldn’t have gone that day. […] I pray for his family every night. This has been weighing on me every single day of my life,” Terrell told reporters. Still, he remains unapologetic to some degree about what happened the day Holmes was killed. “I don’t have to explain myself to anyone. God knows what really happened that day, and God knows what was in my head that day,” he said. The two juveniles involved in the case are still awaiting trial. Needless to say, it will be interesting to see what happens to them. How The Hell Do I Clean A Pair Of Headphones?